When we are kids, many time snake charmer came to our colony and display the snake show. Now we just remember that they saw us one snake with two head. He also said that it run from one side for six month and other for rest of six month. 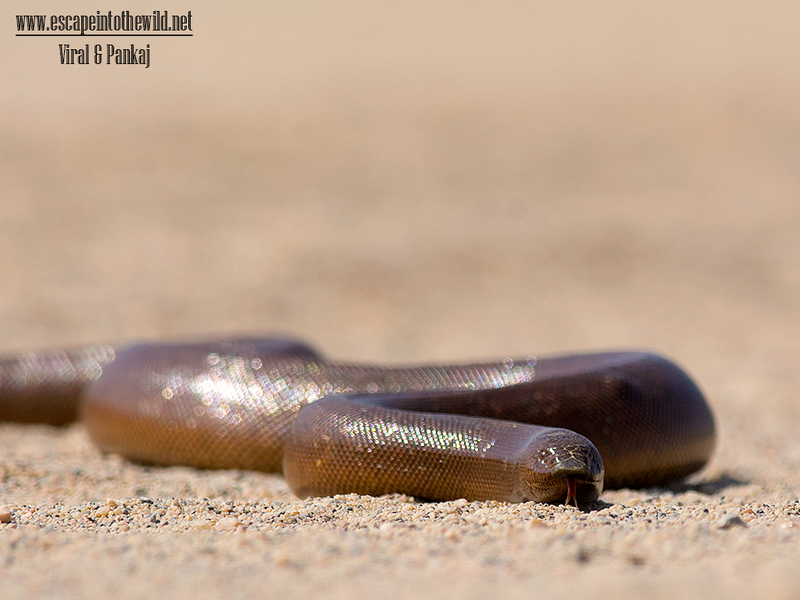 Now we surely know it was Indian Sand Boa. Its tail looks like the head so snake charmer make us fool by it. In year 2015, we visited LRK. We did not get great sighting in ran as temperature is little high. While returning for lunch we saw this beauty on road. We wait until it is passing the road and reach safely to the other side to avoid probability of accident as it already had injured tail. Adults rarely exceed 2 feet in total length. Adapted to burrowing, the head is wedge-shaped with narrow nostrils and very small eyes. The body is cylindrical in shape with small polished dorsal scales. The tail, which is blunt, rounded, and not distinct from the body, appears truncated. Coloration varies from reddish-brown to dull yellow-tan.